The canteen/general purpose pouch has a variety of uses. When using as a canteen carrier, simply slide the top flap down inside the back of the pouch before inserting the canteen and cup. 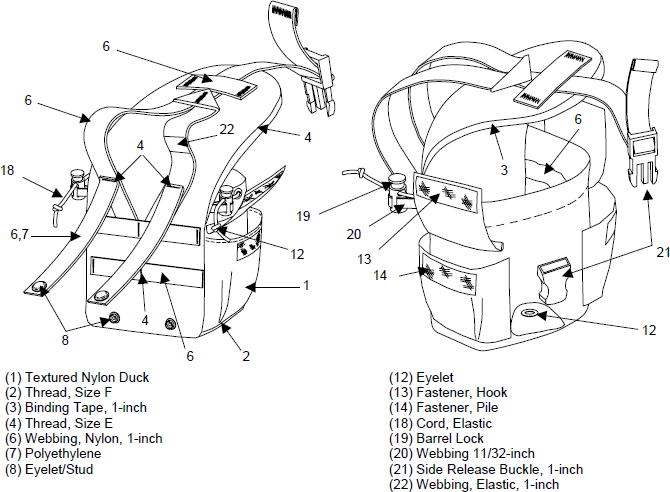 Allow the V-shaped straps to pass over the neck of the canteen and fasten the buckle. For all other applications pull the top flap out, insert the V-shaped strap under the webbing on the top flap and secure the plastic fastener on the front of the pouch. This pouch is able to hold one stripped down MRE, five M16/M4 magazines, or AN/PVS-7 goggles (later PVS-14 with insert), and various other items. The side pockets on the pouch are designed for first aid dressings, water purification tablets or other small equipment.